Welcome to the Topps Tiles Visualiser! To access our extra options such as laying borders, tiling as a range and creating a bespoke area, please ensure your browser or tablet is up to date with the latest software update. If you’d like to continue without the additional functionality, please select Continue. Please note that the additional functionality is unavailable on the iPad1 and some versions of the iPad2. To access our extra options such as laying borders, tiling as a range and creating a bespoke area, your browser must be up to date with the latest software. There was a problem running this additional functionality on your browser and/or device, please select Retry to try again, or Continue to run with reduced functionality. You will be unable to lay borders, tile as a range or create a bespoke area. Choose from a wide variety of Bathrooms, Kitchens, Indoor/Outdoor areas and Commercial spaces. Use our editing tools to mix and match styles, change laying patterns and draw areas for splashbacks and features. Add finishing touches to your room and personalise it too, before adding to basket and checking out. For further assistance, please visit our Help section. We understand it can be difficult to visualise how your chosen tiles might look in your home, which is why we created our inspirational Visualiser. 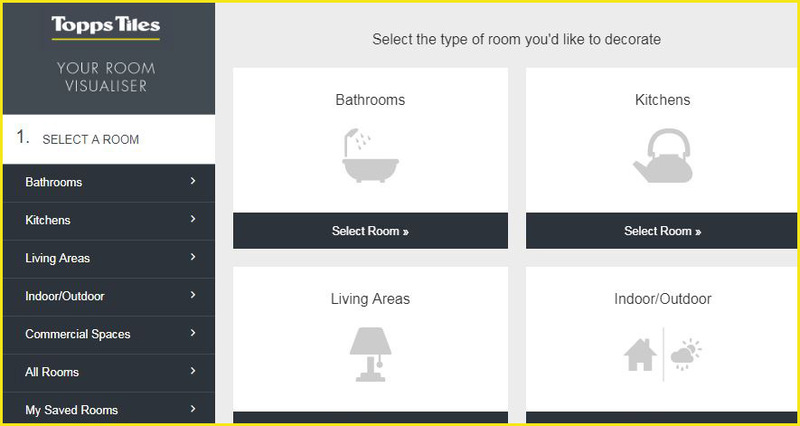 Click “Select A Room” below and choose from a wide variety of Bathrooms, Kitchens, Indoor/Outdoor areas and Commercial spaces. Hover over a surface to see which tiles have been used. Please note you can’t edit these rooms – click ‘Select Room’ from the left hand side panel to create one of your own! Tap a surface to see which tiles have been used. Please note you can’t edit these rooms – tap ‘Select Room’ from the left hand side panel to create one of your own! We will only use this email address for the purpose of sending you your room visualisation. Before you select your room, do you want to save changes to the room that you're working on? Before you share your room, do you want to save changes to the room that you're working on? Before you email your room, do you want to save changes to the room that you're working on? Before you print your room, do you want to save changes to the room that you're working on? Before you view your room tiles, do you want to save changes to the room that you're working on? Choose ‘Select A Room’ from the left hand tab. This will open a range of Bathrooms, Kitchens, Living Areas, Indoor/Outdoor areas and Commercial Spaces for you to choose from. We recommend selecting a room to decorate which best resembles your home. Simply click on the room type you’d like to decorate and then click on your chosen room to select it. This area will also contain any rooms you have previously saved. Choose ‘Tile Your Room’ from the left hand tab. 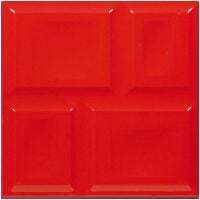 Select the tile type you’d like to use in your room and this will open all available tiles. Scroll down to see more and use the page numbers at the top to click to the next page. To narrow down your search, click ‘Filter Your Results’. This will allow you to search by tile type, size, material, colour, shape and effect; click ‘Apply Filters & Exit’ to view your selections. Please note your filters will apply until you go back and remove them. If you already know the name or code of a tile you like, you can type this in the search box and press the search icon. Along with our wall and floor tiles, you can also view our range of Mosaics, Natural Stone or Borders and Corners. If you’re decorating a Kitchen, you can view Glass Splashbacks here too. Once you have found a product that you like, click on the tile. You have now selected your tile, and once you click on a surface, you will start the decorating process. Please note that tiles which are suitable for wall only cannot be placed on the floor. When you have selected a tile, it will appear in the bottom right hand tab to remind you of your choice. When you click on a surface, you will be presented with different options depending on your room type. You will be asked if you’d like to tile the whole wall or floor, the bottom area of the wall, draw an area or create a splashback. If you choose a Mosaic, you will be given the option of tiling the whole surface, the bottom area of the wall, laying the Mosaic as a border or drawing an area. If you select to lay the Mosaic as a border, it will be placed on the surface and you can then click on the border to change the width of the border, move its position or lay another Mosaic in this area. If you select a tile that is from a mixed range, an overlay will appear and you can select the mix of tiles you’d like to use. The mix will be divided by the number of tiles you choose but you can change this, although the percentage mix must add up to 100%. Once you have tiled your area, you can change the grout colour and/or add Capping and Finishing Strips. To do this, click ‘Add Finishing Touches’ in the left hand tab. You can also change the colour of any worktops or cabinets in a kitchen and walls too. Select ‘Personalise Your Room’ in the left hand tab and then the surface you’d like it applying to. When you make changes to a room, you will be asked if you want to save your changes before you move on to decorate another room. Select ‘Yes’ to add your current room to your ‘Saved Rooms’ or ‘No’ to delete it completely. 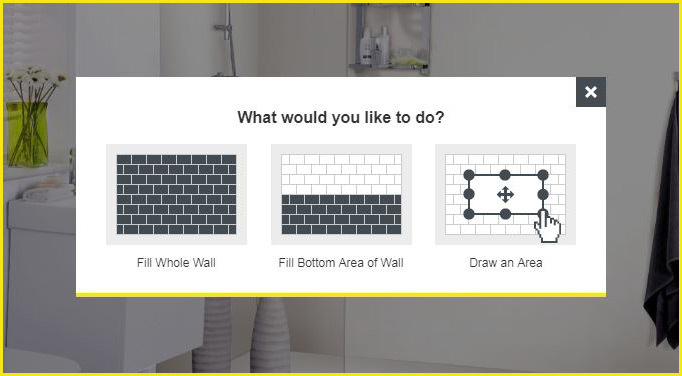 Choose ‘Draw Area’ from the left hand tab, or select it as your first option in the overlay when you go to tile a wall or floor, and place your cursor on the surface you wish to create your area on. This will automatically lay a purple square which you can then move or resize. Simply click on the purple area and three options will appear allowing you to lay your selected tile, move or resize the area or delete the area. To move or resize the area, select this option and then use the yellow guide dots to change the shape and size of the area and the arrows to move the area. Once you’ve created an area you’re happy with, click on anywhere within the room to confirm its placement. You can then select ‘Lay Tiles’ and fill the area with your chosen tile or select a new tile and click in the area to place it here. You can also amend your area later by clicking on it and selecting ‘Move/Resize Tile Area’. Drag the border of the area to change its size or shape and use the arrows in the centre of the area to reposition it. You can also delete your area by clicking on it and selecting ‘Delete Tile Area’. Once you have selected your tile, all of the options to edit your room can be found in the ‘Quick Edit’ panel at the top right of the screen. Single Tile – this option allows you to lay a tile singularly on a tiled surface. Select the tile you’d like to lay and then select ‘Single Tile’. 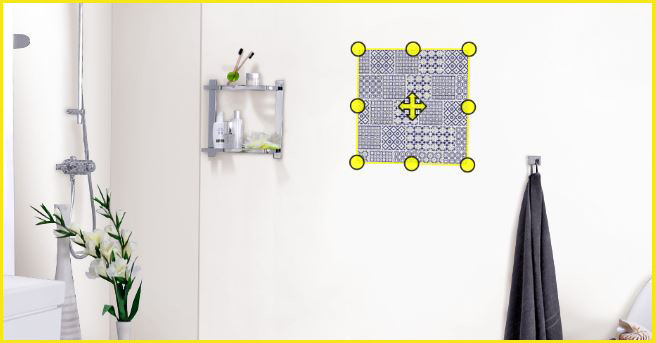 Simply place the tile on the tiled surface in the position of your choice. You will stay in ‘Single Tile’ mode until you select a new tile or a blank room. All of these options can be found in the panel at the bottom right of the screen. To open this, click the yellow tab. To share your decorated room via Facebook, Pinterest or Twitter, click ‘Share Room’ and select the desired social media icon. You can also email your decorated room – click ‘Email Room’ and add in your details. 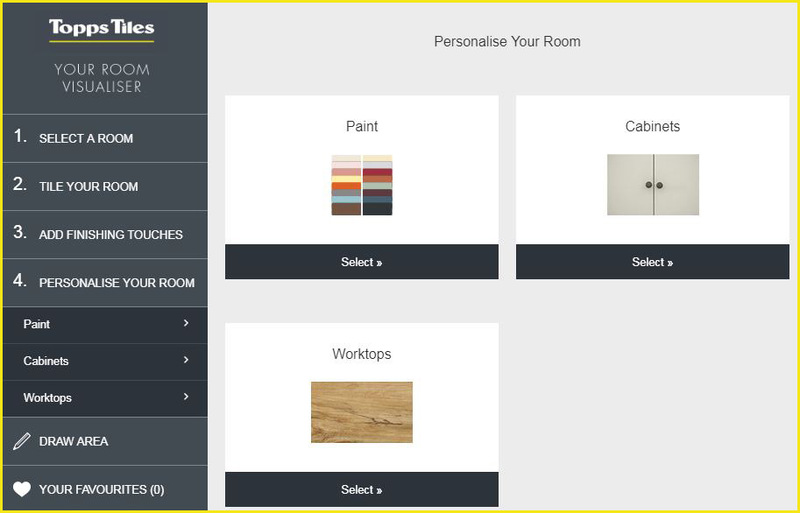 You can send your visualised room to yourself, a friend or even a Topps Tiles store. This will email an image of your decorated room, as well as a list of the products used. To save your room, click ‘Save Room’. Please note that this is saved via the cookies on your machine so you will only be able to view using the same computer. You can view your saved rooms from the left hand tab, in the ‘Select A Room’ link. Here you’ll have the option to view your saved room, view the tiles you’ve used and share/save/print. You can also open the room to make further changes. If you’d like to save the tile you’re currently using, click ‘Add To Favourites’. The product will be moved to ‘Your Favourites’ which can be accessed via the left hand panel. To print your room, click ‘Print Room’. This will print out an image of your decorated room, as well as a list of the products used. To view the tiles you’ve used in the room you’re currently decorating, select ‘View Tiles Used’ on the left hand panel. 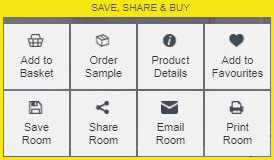 This will display your tiles and give you the option to add these to your basket or save them to ‘Your Favourites’. Once you have selected your tile, the options to place an order can be found in the panel at the bottom right of the screen. To open this, click the yellow arrow. You can either order a sample, or place a full order from here. To place a sample order, click ‘Order Sample’. This will automatically add one tile to your basket. To place a full order, click ‘Add to Basket’. This will open a pop up where you can enter the quantity by pieces, or in m². Simply add your desired quantity and click ‘Add to Basket’ in the overlay. This can be viewed from the ‘Basket’ link in the left hand panel or the top right hand ‘Quick Edit’ tool. When this is clicked, it opens the basket where the quantities can be edited, or you can checkout by selecting ‘Pay Securely Now’. This will link you back to the main Topps Tiles website to make payment. 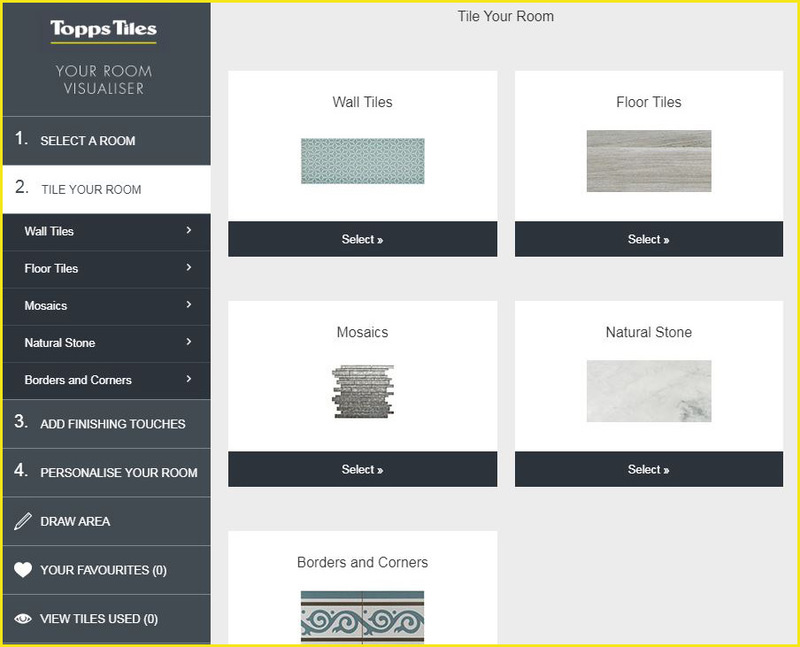 Please note that anything you have added to your basket on the main Topps Tiles website will automatically appear in the Visualiser basket, and vice versa. Once you have selected your tile, the option to find out more can be found in the panel at the bottom right of the screen. To open this, click the yellow arrow. To find out more information about your selected tile, click ‘Product Details’. This will open up the product page on the main website, in a new tab. Please note that some tiles may not be suitable for commercial areas. To double check please call Customer Services on 0800 783 6262 or visit your local store. Please create a room and then save it here where it can be admired, edited or even sent to your friends! Please note these grout colours are for illustration purposes only. Not all grouts can be used with all ranges, such as our Indoor/Outdoor range Spaces™. [TOTAL] Products Found. Displaying [FROM] - [TO]. To help find the tile you are looking for, make your selections from the choice below. You can filter by type, size, material, colour and shape. Click ‘Apply filters’ to show the tiles which fit your criteria. 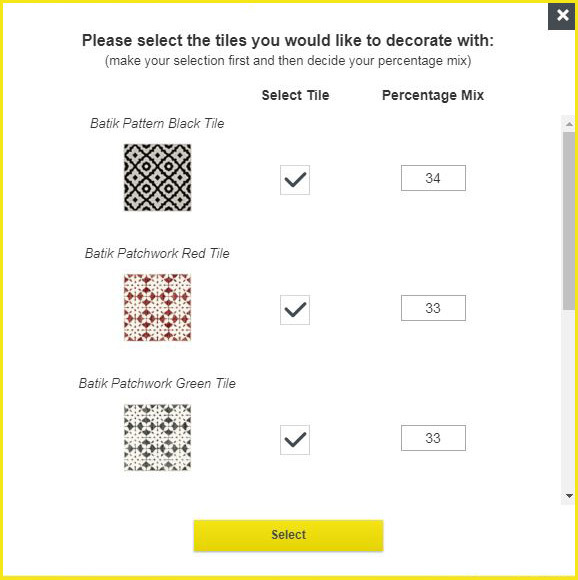 To help find the tile you are looking for, make your selections from the choice below. Click ‘Apply filters’ to show the tiles which fit your criteria.